The New York skyline, and Freedom Tower, as seen from the 46th floor of the Trump Soho Hotel. Even spending just a few days in New York City results in a host of stories. I can't imagine spending a lifetime there. Here are few more from my trip. In New York I always felt like I was in the way. Even with designated walking and biking lanes, certain areas get so tight there really is not actual separation. And with people moving in all different directions you constantly find yourself heading straight into another person’s path. In other parts of the world, this usually means you start to walk a different path. Not New York. In one such instance, I was headed toward a staircase while another guy was descending down. We were aimed right toward each other. Did he start to dive to his right while I did the same? No, he kept his line while uttering “MOVE. MOVE. MOVE." A line of patrons waits to be seated at Dim Sum Go Go in New York's Chinatown. An assortment of chinese dumplings at Dim Sum Go Go. One of my favorite Seinfeld episodes, and likely shared by many others, is “The Chinese Restaurant,” where Elaine, George and Jerry are waiting to be seated at a New York chinese restaurant. The entire episode consists of them waiting and never getting that table. I had my own moment with my three friends as we stood outside of Go Go Dim Sum in Chinatown. We were number 82, and as the numbers crept up closer to ours, we noticed numbers 84 and 85 and others higher than 82 were being called. They seemed to being going to larger and smaller parties than ours, so we just assumed our "just the right size" table was not ready. At one point we even got a "you’re next." But minutes ticked away and more tables were seated. Finally, we asked what was going on and apparently our names had been crossed off, the host thinking we had been seated. Once we were finally seated, we ordered several dim sum dishes, including a veggie sampler platter. Also despite not ordering it, a pot of tea was placed on our table. While two of my friends and I feasted on our carnivore friendly dishes, our one vegetarian friend waited and waited for her sampler. And we drank the tea. On three occasions we asked for a status, and after 45 minutes of completing all of meat-laden dishes, the veggie platter came out. The server was apologetic and began to motion to the platter that was sitting next to that pot of tea that was brought out -- once again, without us ordering it -- to our table earlier. He apologized for how long it took for the food to come out and as a make good, would not be charging us for …. the tea. The tea, that we did not even order. We waited 45 minutes for a plate of food after our initial order of food was brought out. And they comp the $2 tea? New York City is known for being a city that moves at such a fast pace. People zooming and weaving through each other, honking their car horns and paying no mind to "Don't Walk" signals. But I discovered something rather interesting. To get anything done in New York actually takes a lot of time. In that sense, it’s a city that moves rather slow. The problem is, with so many people in such a confined space and most whose only means of transportation is to walk or use public transit, you are at the mercy of those two things. How fast can you walk? How quickly will the train or bus get you where you need to go? With a limited amount of time in the day, there are are only a few things you can really get done. Whereas, in a place like San Diego, where everyone drives, parking is plentiful -- yes even in the Gaslamp as compared to New York -- one can check many things off their "to do lists" throughout the day. And if you forgot something in one part of town, just get back in your car and double back. There is no doubling back in New York, well not at least if you are not on a time crunch, and who isn't these days. New York, in my observation, is the slowest, fast paced city I know. In case you missed it, here is Stories From New York, Part 1. For a few days, Justin Kanoya traded in the title of San Diego DJ, for New York DJ. After spending a few days in New York I completely understand why Jerry Seinfeld and Larry David, creators of “Seinfeld”, one of the most successful TV sitcoms of all time, had no shortage of material. Being in New York was like being in an episode of Seinfeld. It was like nothing, but still everything. And I really can't make this stuff up. I've heard these words before, usually coming from a person who works the average 9-5 job that keeps them within the comforts of a cubicle. But this time those eight words were coming from someone who arguably has a way cooler job than me. They were coming from Anita Patrickson. A wardrobe stylist. But not just any stylist … a celebrity stylist. The type of person whose job is to suggest to Hillary Duff which piece of statement jewerly she should wear to the MTV Video Music Awards; confirm to Julianne Hough that her “boyfriend blazer” is just right for that Super Bowl party; and to let Chrissy Tiegen know that yes, indeed, her ensemble for the Golden Globes looks perfect because, well, she’s a supermodel and basically she looks good in everything. And I only know the term “boyfriend blazer” because I saw it on Anita's Instagram. I play the music of today’s hottest stars. Anita hangs out and dresses them. I guess “best job” is all relative. I only had one response as she took a stab at scratching on my Techincs 1200s. Celebrity stylist Anita Patrickson took a shot at DJing during the launch event for Fitbit Alta. This is the 'Shroom Burger at Shake Shack. Looks delicious and is delicious. But there's no meat. This was my first journey into New York since the existence of Shake Shack, the popular burger and milkshake joint. I was excited to finally try this burger, and the stars lined up as I found myself in close proximity to one as my friends and I were deciding on a dinner spot. In fact, we were at the original location located in Union Square. After a quick scan of the menu, I had committed to the SmokeShack, a cheeseburger topped with bacon and chopped cherry peppers. We waited in a relatively short line and just as it was my turn to walk up to the counter, I hear my friends discussing about the ’Shroom burger and the ’Shack Stack. I see the ’Shroom has something to do with a fried mushroom and as all of this is happening and I wanted to ask them what the difference in the two were, I get called up to the window. Without knowing the difference between the ’Shroom and Shack Stack, I idiotically switch my SmokeShack order to the ’Shroom, assuming I was in for a taste of a meaty and fried mushroomy goodness. I would soon find out the difference. For those not in the know either, the ’Shroom is simply a friend mushroom patty. No meat. What vegetarians order at Shake Shack. I left New York, without having the chance to get back to a Shake Shack and have yet to taste one of these burgers. Generally when pedestrians bump into each other, they will apologize and move on. This is especially true in San Diego and something I noticed in my recent travels in San Francisco and, of course, Vancouver. As I was walking among a throng of people on a subway platform, a man, looking to be in his late 50s/early 60s, with a rolling suitcase was approaching and about to cross my path. One of his wheels ended up rolling over the foot of the guy walking next to me, slightly tripping him up. A stare down ensued. The man, also appearing to be about the same age as they guy who just had his foot rolled over, had a look of disgust. What does the man who had just committed this understandable accident say? Does he apologize? Nope. He simply uttered with equal disgust and that New York accent: "Maybe you should pay better attention." November Project is the free fitness group I am a part of in San Diego, and there are tribes all over the country that welcome visiting members with open arms. I was excited when I realized my New York trip was overlapping with a 6:30, Wednesday morning, the day and time NP meets all over the U.S., Canada and Europe. I Uber'd to the workout, because guiding my noob self on the MTA at 5:30 a.m. just seemed like a recipe for disaster. But after the workout, knowing I had time to spare and new friends (NP-NYC peeps) to help me guide me to the nearest subway station. When we arrived at the ticketing area we were met with two very long lines to purchase tickets. I said my goodbyes to them as I got into line and they scanned their transit passes and headed to their respective platforms. And I began to wait. After about one minute, I hear someone yell my name, "JUSTIN!" I look over toward where I thought I heard it coming from, trying to make out a familiar face through a crowd of New York commuters. And I see Tammy, on the other side of the fence, motioning me to come over. She opens the emergency exit door, the one exiting passengers use when they don't want to use the turnstile exit. Technically you're only supposed to use this in an emergency, but when's the last time a New Yorker followed rules. With the door swinging open, she motions me toward her, and enter through this exit, without a ticket. Want more? Here is Stories From New York, Part 2. Celebrity fitness trainer Harley Pasternak was on hand to lead a workout where all the participants were using the new Fitbit Alta. Fitbit released a new wearable fitness device on February 2, 2016 and it is called Fitbit Alta. I was on hand for its unveiling to journalists that cover the tech, fitness and fashion industries. The launch event took place in New York City at the Trump Hotel in Soho. My role was to DJ two 30-minute workout sessions, because why else would you unveil a fitness tracker to a group of gadget writers and not have them use it right away. Celebrity fitness trainer Harley Pasternak and stylist to the stars Anita Patrickson were on hand to help introduce the new device, a slim, sleek fitness wristband that can be personalized to fit your style. It is designed with a satin finish, stainless steel body and features a line of interchangeable bands in multiple colors and premium materials. San Diego DJ, Justin Kanoya, plays a hip-hop music set for the Fitbit Alta product launch and workout led by Harley Pasternak. 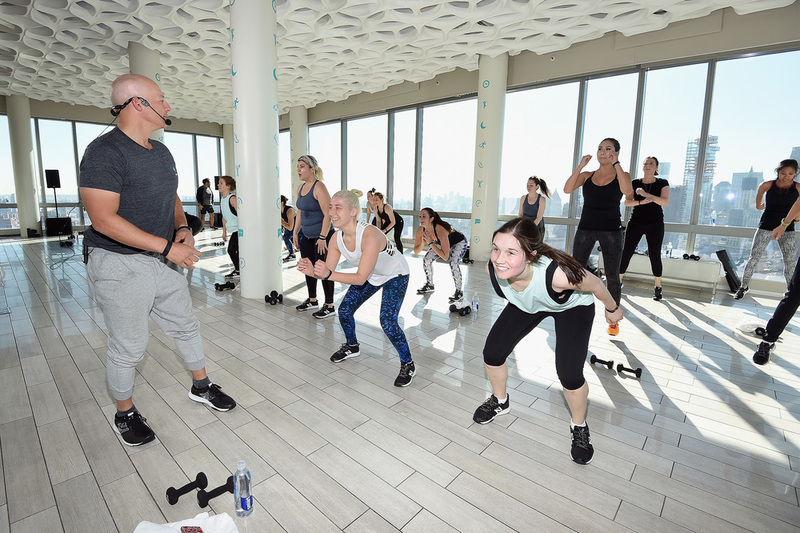 After getting styled by Anita in a new workout outfit, the guests were brought into the SoHi room, a space high above the city that has an amazing views of Manhattan and New Jersey. Harley then ran them through an intense workout that included, squat jumps, shadow boxing, core work and some weight training. You can find the full workout to do at home on Fitbit's blog. As per Harley's request, I put together a set of current, mainstream hip hop with a New York/East Coast flavor. I even made sure to put in some old school Big Daddy Kane, but am now regretting that I didn’t play any Beastie Boys. Oh well, I’ll save it for the next time I’m back in the city. Fitbit Alta product launch in New York City, February 2, 2016. San Diego wedding, corporate, yoga and fitness DJ, Justin Kanoya, was on hand to DJ the first workout with the new Fitbit Alta wearable fitness tracker. Congratulations to the Fitbit marketing and product development crew on the launch of Fitbit Alta. Celebrity stylist, Anita Patrickson, in the DJ booth with San Diego DJ, Justin Kanoya. All photos courtesy of Getty Images for Fitbit. Lastly, here are some initial articles on the device, a few of which are written by the guests that were in attendance.